Thinklogical, a manufacturer of secure, high-performance signal extension and switching systems for video-rich applications, will showcase its TLX series matrix switches and extenders at IBC 2015, September 11-15, at the Amsterdam RAI in stand 10.A24. The company said its TLX is the first system able to extend and switch uncompressed 4K and Ultra High Definition (UHD) video at full resolution and color depth (up to 4096x2160 resolution, 4:4:4 color depth) at 60Hz frame rate using only two fibers or CATx cables. 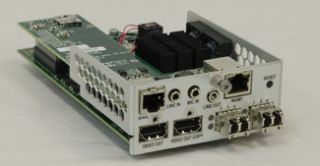 TLX provides 10Gbps performance and a flexible and modular uncompressed signal transmission architecture, reducing the cost and infrastructure required to manage content created in the growing 4K/UHD industry standard.